A diocese of evangelized and unity led by model and competent leaders in practicing deep spiritual Life and promoting holistic development in communion with others. - Mature and prayerful life, self-sacrificing and witnessing our faith to be model to others under the guidance of the Church and obedience to civil laws. - Proclaim, preach and teach the Good News of salvation of mankind with perseverance and redemptive love of Christ. - Unity among ourselves by adapting to local cultures and harmonious relationship with other religions in sharing our faith and common beliefs. - Spiritual, technical, social and leadership formation relevant to our program, services and relative to Church social teachings. - Uplift the living standard of the poor and needy through education and promoting abilities in using and sustaining community resources. 1868 - Arrival of PIME Missionaries, took charge of the Eastern Burma, stationed in Taungngu. 1870 - Erected Apostolic Prefecture of Eastern Burma. 1890 - Erected Vicariate Apostolic of Taungngu. 1950 - Kyaingtong was divided from the Vicariate Apostolic of Taungngu and raised to that of Vicariate Apostolic of Kengtung (Kyaingtong). 1955 - Erected Diocese of Taungngu. 1961 - Division of the Diocese of Taungngu and Diocese of Taunggyi. Bishop Bigandet's first tour of the country brought him to Taungngu on 17 January, 1857. Fr. George D' Cruz had been there about a year as chaplain to soldiers established there. Apart from soldiers, there was hardly a catholic in the town. When Fr. D' Cruz was relieved from his post as chaplain in 1858, by Fr. Guerin, MEP. He entered upon a ten years Apostolate of the Karens of the high-land of Taungngu area. The first priests of the Milan foreign Missions Society, PIME, arrived in 1868. They found a station with two catechists at Leiktho and about 150 Catholics in the town and country side, apart from the soldiers. Fr. Eugene Biffi, Fr. Rocco Tornatore, Fr. Carbone and Fr. Conti were the first missionaries. The area originally given to them for work was the territory East of Salwin, but the penetration of the area was impossible. They were therefore asked by Bishop Bigandet to take care of the hills, west of Salwin as well as the mountains to the East and offered Moulmein or Taungngu as head-quarters. Taungngu was chosen as a more covenient center. In 1870, this enlarged territory agreed upon with Bishop Bigandet was erected into the Prefecture Apostolic of Eastern Burma with Msgr. Biffi as its first Prefect. The tremendous work done by these and subsequent Italian Missionaries would require volumes to discribe. In 1890, Taungngu was raised to the status of Vicariate Apostolic and Msgr. Rocco, the Prefect was consecrated by Bishop Bigandet on the occassion of the solemn opening of the Cathedral of Mandalay. On 26 January, 1908, Bishop Rocco died in Yado and was buried in Leiktho. On 24 January, 1909, Bishop Emmanuele Sagrada was consecrated and he suceeded for about 30 years, resigned at the age of 76, and died in 1939. At the resignation of Bishop Sagrada, Bishop Alfredo Lanfraconi who was consecrated in 1937 to succeed as Vicar Apostolic of Taungngu and raised to that of Vicariate Apostolic of Kyaingtong and Fr. Guercillena was chosen as its first Vicar Apostolic. On 1 January, 1955, the Vicariate Apostolic of Taungngu was raised to the status of a Diocese with Bishop A. Lanfraconi as first residential Bishop. In 1959, Bishop A. Lanfraconi was pursuaded to return to Italy for medical treatment and died there in November 1959. From 1959 to 1961, the diocese was ruled by Vicar Capitular Msgr. Pasquale Ziello, PIME. In March 1961, the Diocese of Taungngu was divided, the Southern part as the Diocese of Taungngu, entrusted to the indigenous clergy and, the Northern part as the Diocese of Taunggyi. Bishop of Taungngu, Msgr. Sebastian U Shwe Yauk was consecrated on May 21 by Pope John XXIII in Rome. He ruled the diocese for 27 years. On June 4, 1984, Fr. 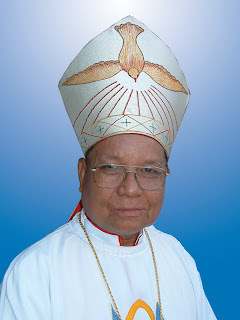 Isaac Danu was appointed Auxiliary Bishop of the Diocese and consecrated on January 17, 1985 at Leiktho Takone by Bishop Sebastian U Shwe Yauk. He was the Titular Bishop of Bonusta. Bishop Sebastian U Shwe Yauk died on 13th July, 1988. Bishop Isaac Danu was appointed Administrator of the Diocese on 1 September,1988. On September 20, 1989, he was nominated Bishop of Taungngu Diocese. Gheba Kayins, Ghekho Kayins, Sgaw Kayins, Bwe Kayins, Sokhu Kayins, Burmese, Indians, Chinese, Few Kayahs, Few Kayaws and Few Shans.